American composer Peter Lieuwen was born in 1953 in Utrecht, the Netherlands, and raised in the US. He studied composition with Scott Wilkinson, William Wood and other notables, and his works have received performances from major orchestras that include the Saint Louis Symphony, Royal Philharmonic, San Antonio Symphony, Pacific Symphony, Slovak National and from various chamber ensembles, as well as individual artists like pianist Marc-André Hamelin. 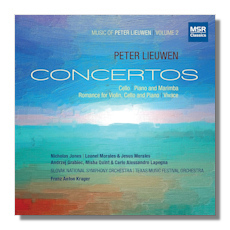 Lieuwen's style is conservative and tonal, if I can judge by just the music on this disc. That said, it's not without individuality and distinction: his music is very spirited and bright and strikes you as fairly original, despite taking on minimalist aspects at times in his rhythms, which also incorporate elements from jazz, rock and world music. The moods here are generally light, but the music isn't lightweight: while Lieuwen often sounds optimistic and playful, he is subtle and very tasteful, with no hint of note-spinning or bombast. Moreover, he does have more than a few serious, even profound moments. The Cello Concerto, premiered in 2012 by the soloist here Nicholas Jones, with conductor Franz Anton Krager, leads off the disc. The opening movement carries the marking "buoyant and animated", and that pretty much describes the music. It effervesces in its busyness, exuding joy and energy throughout. It will strike you as being more about motion and rhythm than melody and deep expression. The second (and final) movement is quite lyrical and touching in the first half, but then develops a kinetic rhythmic nature of its own. When the tempo quickens the music initially takes on a slightly dark character before finally yielding to a more energetic and joyous manner, especially after the somewhat cerebral cadenza. A good, solidly crafted work, but I believe the 2008 Concerto for Piano and Marimba is the better of the two. In a remote way, Lieuwen reminds me of Martinů in the Piano Concerto, almost as if the Czech composer had absorbed Latin rhythms and certain American stylistic elements. Anyway, actual similarities in style between Martinů and Lieuwen, of course, are only very vague at best: both seem to have a penchant for transparent scoring, for very playful activity in the piano's upper register and for emotionally light moods. Perhaps it's more the quirky and indomitable spirit of Martinů that I notice here and there rather than particular compositional traits. At any rate, the piano and marimba make an interesting pairing here: I can't recall this instrumental combination in any other large work of consequence, but Lieuwen makes it work splendidly even though the marimba's role is comparatively limited. Cast in three movements and lasting twenty-seven minutes, it's a fine piece that can grow on you quickly. Its exoticism and carefree manner in the first movement are infectious, but it may well be the more lyrical but equally colorful second movement that is the real gem here. That said, the finale, with its Latin-drenched rhythms and bustling manner, immediately captures your attention and holds it right through its nearly eleven minute length. The ending, with foot-stomping Latin rhythms and then ecstatic descending chords on the piano, is quite memorable. The two shorter works that come in between the concertos are both worthwhile compositions, though I think the Romance for Violin, Cello, and Piano (1994; rev. 2010) is the more substantive of the two. Still, there's much to be said for the dreamy and bouncy but somewhat conflicted character of the brief Vivace for String Orchestra (2010). All of these performances are recording premieres and to my ears all are excellent. The soloists in the concertos are especially convincing and Franz Anton Krager draws consistently spirited performances from the Slovak National Symphony Orchestra and Texas Music Festival Orchestra. MSR provides vivid and well balanced sound reproduction. If you're interested in new and very approachable music, this disc should not disappoint.